Outside of saving the whales and preventing the spread of HIV/AIDS, there have been few global campaigns in recent decades more visible than the one against the destruction of the Amazon rainforest. For the public, the arithmetic is simple: donate money, save trees, help the environment. Little do most well-wishers at Starbucks or elsewhere realize, the impact of coffee cultivation is insignificant compared to the environmental cost of the protein it will wash down. 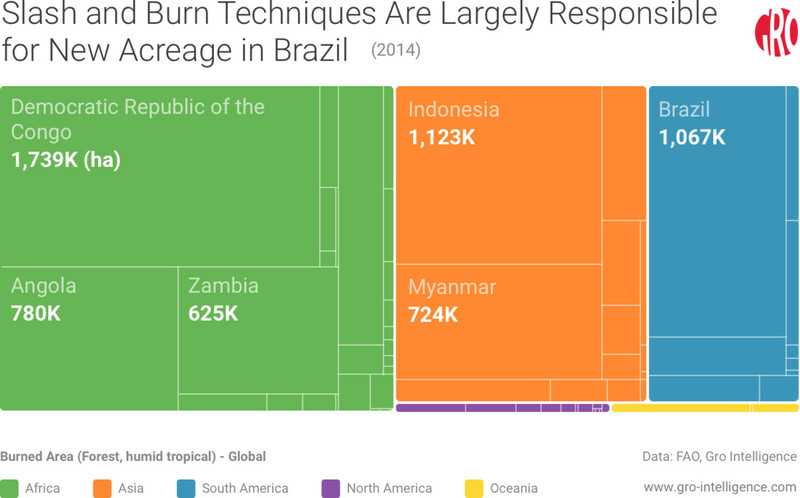 Despite public ignorance, activists have had some success in slowing the advance of deforestation in the Amazon, such as a 2006 moratorium on deforestation for soy fields. Yet the Amazon continues to shrink. To further complicate matters, the Brazilian government is entering the fourth year of a corruption scandal that has already displaced one president, and it may soon displace another. Meanwhile, global soybean consumption shows no sign of slowing down. As the world’s largest exporter of soybeans, beef, and frozen poultry, Brazil has some choices to make. In light of the country’s upcoming planting season, it pays to wonder how these factors might converge. How might they affect soybeans, the world’s second most exported agricultural commodity, in the world’s largest exporter? 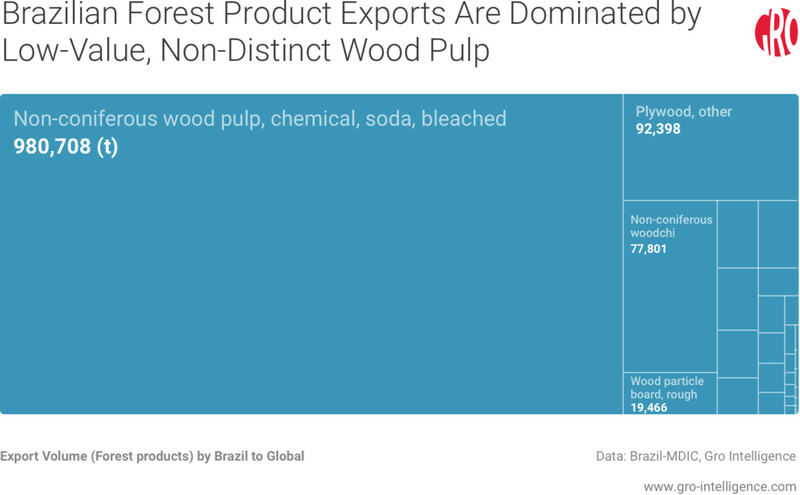 Most assume that demand for lumber and other forest products is responsible for the greatest share of deforestation in the Amazon. Rarely is that the case. Only 2 to 3 percent of deforestation was caused by legal and illegal logging between 2000 and 2005, some of the busiest years for loggers. 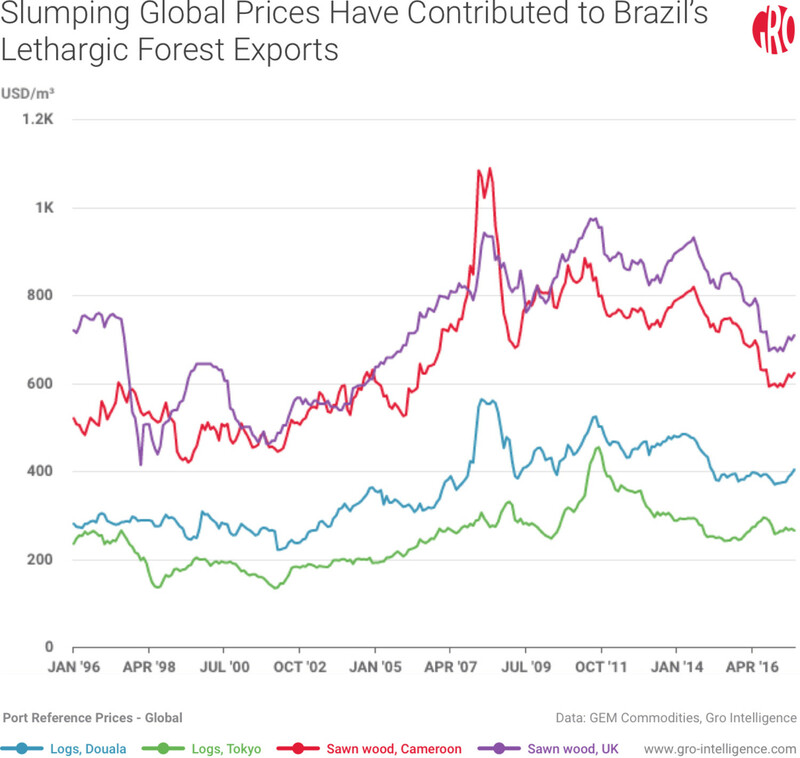 Global prices for key forest products have barely risen from two decades ago, and most of Brazil’s forest product exports reflect this stagnation. A smaller, yet significant, percentage of the public assumes that global coffee, rubber, or sugar demand is the primary cause of deforestation in the Americas. Yet many of these crops now occupy a fraction of their former area—chiefly rubber. 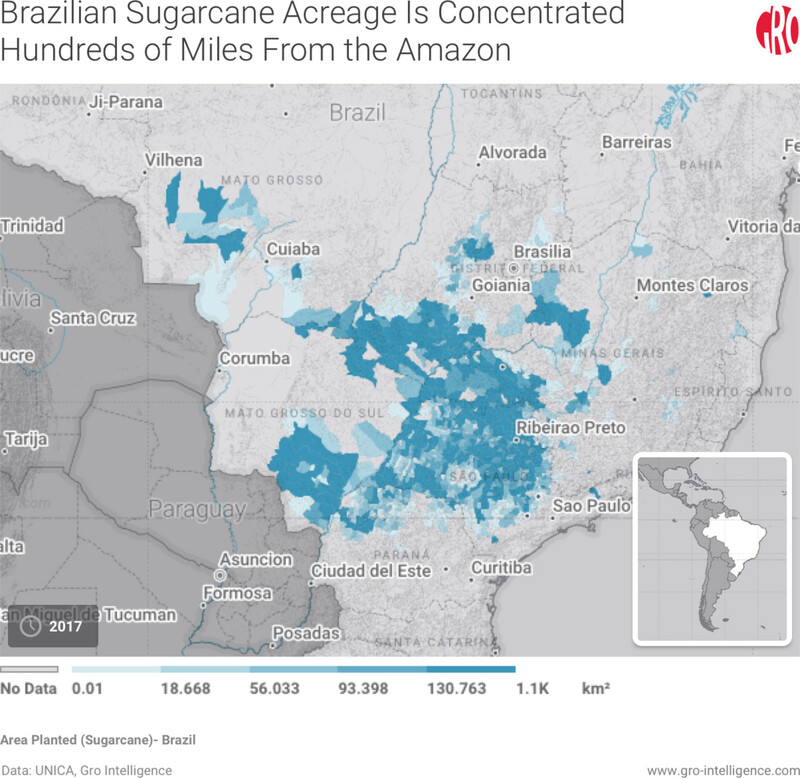 Meanwhile, crops such as sugarcane and arabica coffee are primarily planted in regions far from the Amazon. Growing in warmer and lower climates between 200 and 800 meters above sea-level, robusta coffee is a notable exception. Global coffee consumption is expected to jump 25 percent between 2015 and 2020, and forest-rich areas such as Rondonia in the western Amazon will likely feel the pressure from farmers looking to meet demand. Cattle ranchers and their animals’ insatiable hunger for pastureland are the largest strain on the Amazon. Roads typically begin the deforestation process, followed by logging. But, both processes generally occur in anticipation of ranchers and the farmers who move in afterward. Mining, road construction, and logging combined accounted for only 1 to 2 percent of total deforestation between 2000 and 2005. Agricultural land, mostly soybean acreage, accounted for 25 to 35 percent of all deforestation. Cattle ranching alone accounted for 65 to 70 percent. 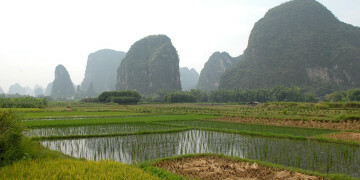 Deforestation driven by large-scale agriculture slowed markedly after 2005. The world’s first soybean moratorium was adopted by the Brazilian government the following year, which effectively banned the direct conversion of forest to soy fields. 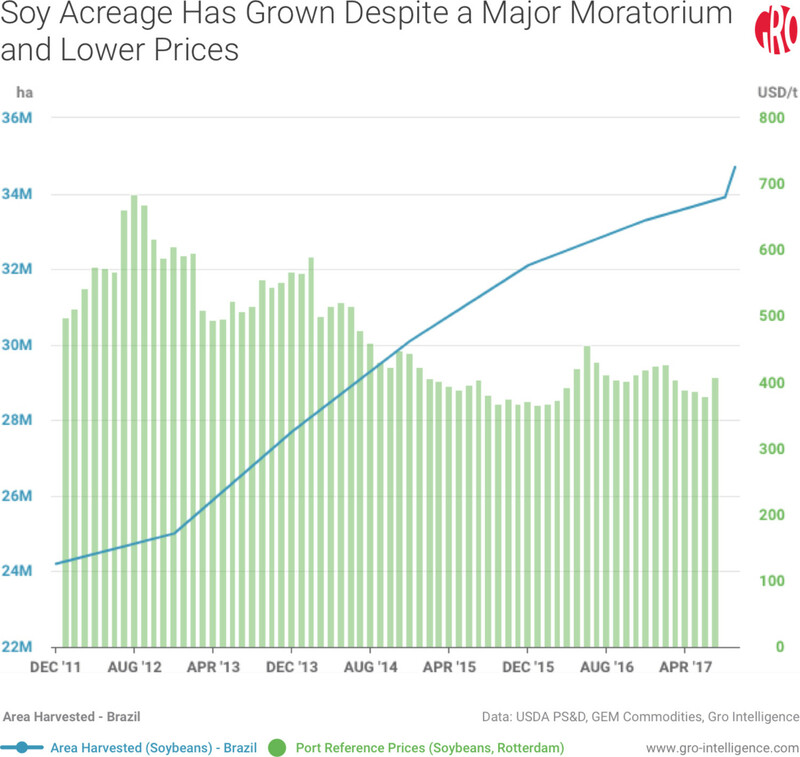 Yet soy acreage keeps growing despite slumping prices. Importantly, cattle ranching has continued to proliferate. 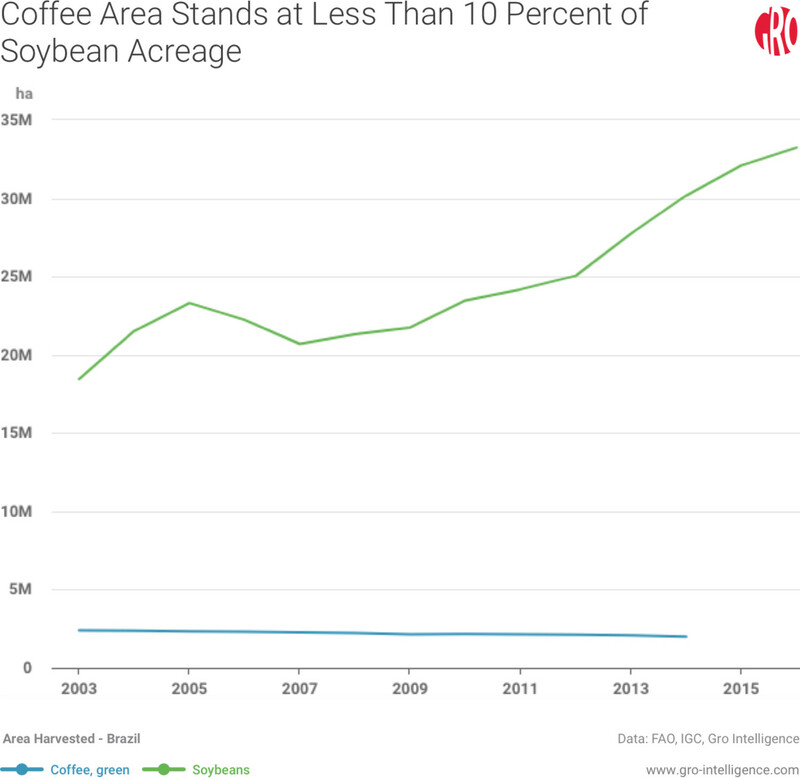 Between forest cleared by ranchers and agricultural smalholders, large soybean agribusinesses have been able to move into cleared spaces and expand despite the Soy Moratorium. So much of the Amazon had already been cleared prior to the agreement that a surplus of available land existed. Most farmers simply expanded into unused pasture land without need for added deforestation in the following years, according to a study published in Science Magazine. Despite environmental groups’ view of the moratorium as a historic success, Brazilian farmers see it as little more than a veiled non-tariff trade barrier. Cargill and Bunge were among the major corporate signatories, which further reinforces the suspicion that the moratorium ultimately aimed to protect soy farmers in the Northern Hemisphere. Meanwhile, forest continued to be burned, cleared, grazed, and planted with soybeans by a significant number of loggers, ranchers, and farmers. There is no shortage of moneyed interests advocating for and against the further opening of the Amazon. Although the Soy Moratorium was renewed in 2015, the following year again witnessed the most area under soybean acreage in the country’s history. The trend is expected to continue in the 2017/2018 growing season. The Dilma Rousseff Administration had long been kind to corporate interests prior to her impeachment, and former Vice President Michel Temer appears determined to move forward with a similar agenda. The Temer Administration opened an area in the Amazon the size of Denmark to mining in August. Yet just last week a judge ruled President Temer’s decree unlawful on Aug. 30, a decision emblematic of the greater intransigence within Brazil’s public sphere. The Temer Administration has vowed to appeal the ruling. If the judge’s decision is upheld, Temer will need congressional approval for any significant opening of protected forest, an unlikely scenario given the president’s historic unpopularity. Political developments may be a secondary influence compared to the development of new and sorely needed infrastructure. Large construction deals, such as the 3,300 mile long Chinese-led railway stretching across Brazil and Peru, have floundered since the 2014 corruption scandal. Brazil’s economy contracted for eight consecutive quarters between 2015 and 2017. That and a related lack of capital have constrained large scale infrastructure projects severely. Brazil possesses one of the longest coastlines in the world, yet aging ports are rarely deep enough to accommodate newer Panamax and Capesize bulk freighters. 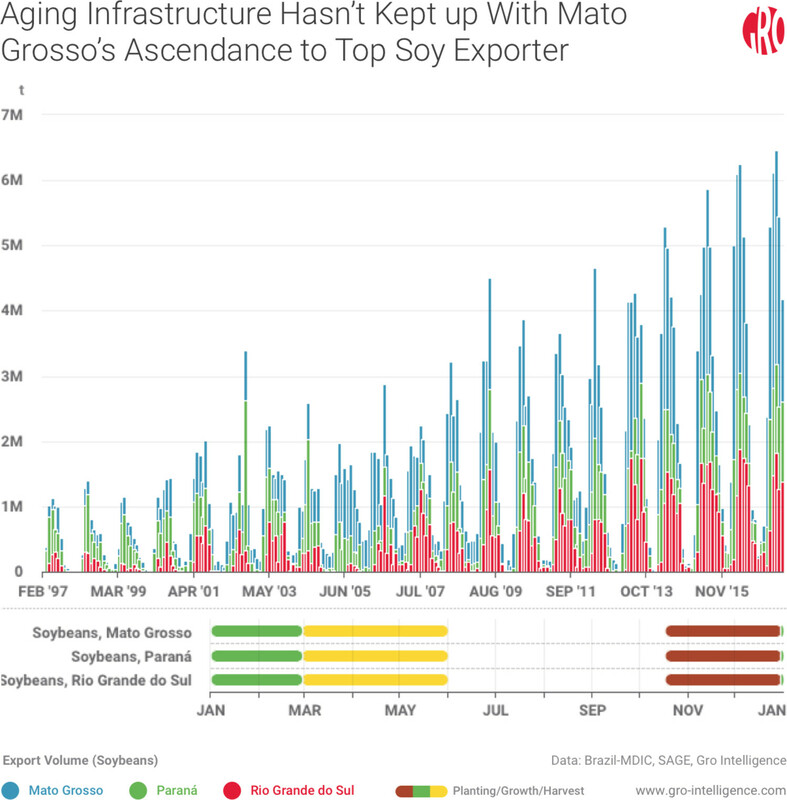 Recent soybean plantings have also been concentrated in inland states like Mato Grosso, which still requires long-haul trucking for over 70 percent of its crops to reach southern ports. Long term projects such as ADM’s Santos port expansion are beginning to come to fruition, but capital constraints may continue to limit growth moving forward. From a macro perspective, monitoring the country’s borrowing and foreign direct investment trends under the new administration may provide key insight into Brazil’s agricultural potential, especially given the lethargy of the domestic economy. Monitoring the pace of small scale infrastructure projects linking formerly heavily-forested growing regions may therefore provide the best insight into seasonal exports on a more immediate scale. Brazil’s soybean planting season is fast approaching. 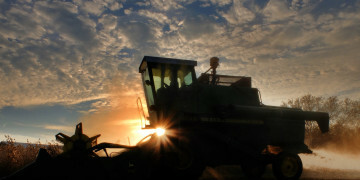 Farmers in Paraná, Brazil’s second-largest producing state, will start planting soybeans as soon as September 11. Starting five days earlier than last year, farmers will be testing earlier planting stages with an eye towards higher yields. Despite export prices out of the Paranagua port down 10 percent year-over-year, the USDA projects total Brazilian soybean acreage to increase an additional 80,000 hectares, or 2.4 percent. Meanwhile, infrastructure projects that were started years ago are beginning to conclude. Brazil’s ability to export more soybeans from the hinterlands will continue to slowly develop, regardless of the present federal gridlock. 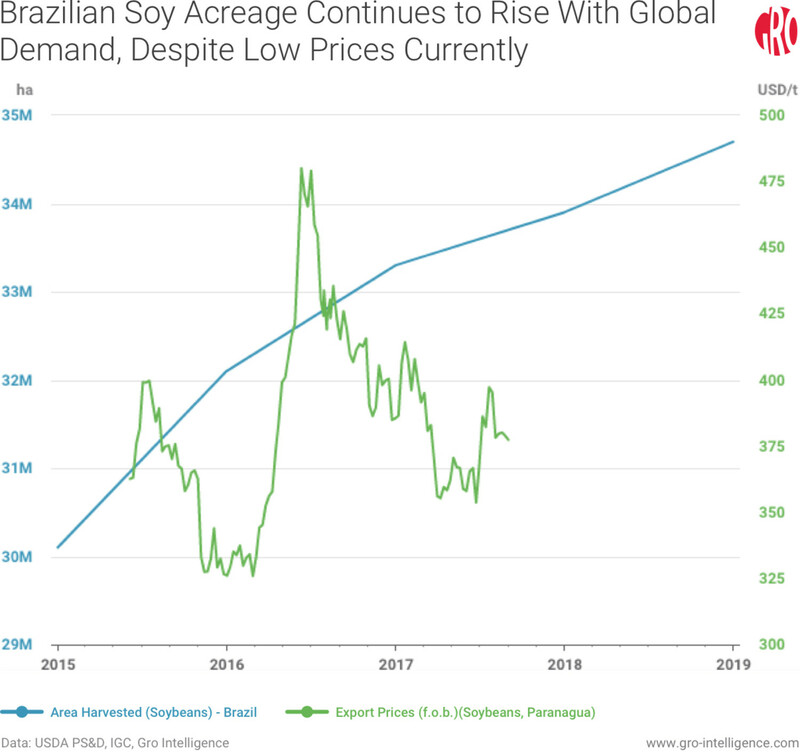 Domestic soy demand is also projected to rise, according to recent USDA forecasts, driven by Brazil’s ever-increasing cattle stocks. 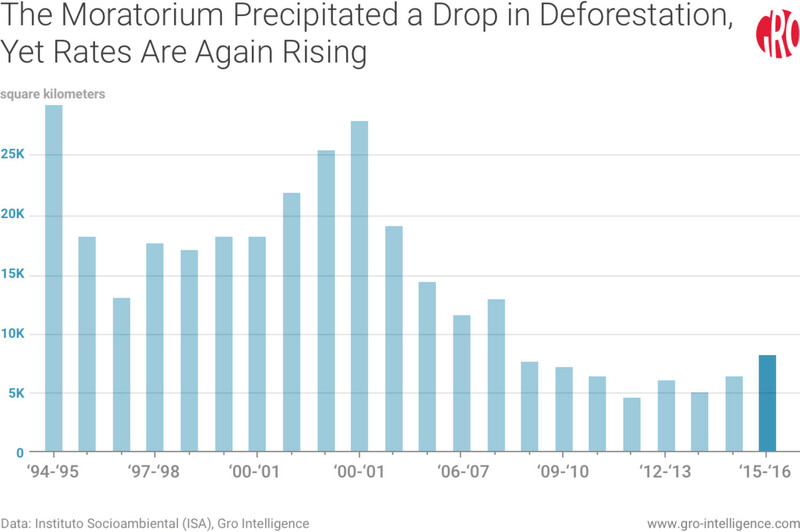 Deforestation will assuredly continue, albeit at speeds far slower than before the 2006 moratorium. Ranchers and small scale farmers are likely to deforest between 5,000 and 10,000 sq km—or 500,000 and 1,000,000 ha—over the course of the year. Regardless, so much forested area has already been cleared that there should be no short-run constraint on additional soy acreage. Outside of transportation bottlenecks, the health of Brazil’s economy could play an important role in the strength of its soybean exports. The IMF expects Brazil’s GDP to finally return to the black this year. Although 0.3 percent GDP growth is still languid, the Brazilian real did strengthen by 6 percent in July. It will be important to monitor any further appreciations in value, as large jumps could threaten the favorable exchanges received by importers. Hot and dry weather conditions have been a source of some concern for Brazilian farmers, yet plantings are still scheduled to take place as planned. In the unlikely event that the rainy season is significantly delayed, final yields could suffer. 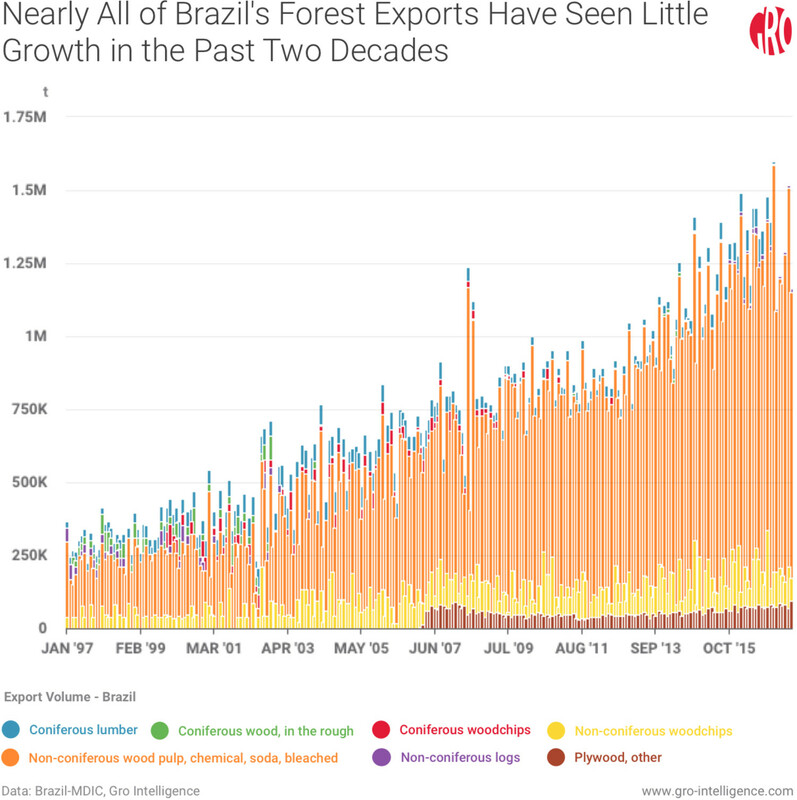 Despite Brazil’s ongoing political uncertainties, maturing fundamentals in the country’s agriculture sector will allow farmers to meet growing global soybean demand at less expense to the world’s largest tropical rainforest in the short term. 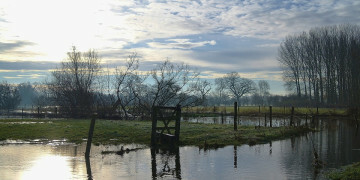 When currently unused pasture land is exhausted in the longer term, however, it may be another story.